Elsie Thurston passed peacefully at Foothills Medical Centre, Calgary, Alberta, on November 9th, 2017. Born on February 29th in a leap year, Elsie was in her 93rd year, although she would claim she was only 23. Predeceased by her husband James Melrose Thurston. Devoted mother of Letisha (Tom), Peter (Cathy), Jeff (Bettina), and Liz (Doug). Adored grandmother of Sarah (Don), Michelle (Gregg), Jeremy (Jodi), Adam, Talia, Karen (Evan) and Ashley (Nathan) and great- grandmother of Alexis, Kate and Foster. Elsie is survived by sisters Dorothy and Myrtle. Predeceased by parents Harry and Edith Mundy, sisters Charlotte and Edith and brothers Edward, Victor, Harry, Albert, Ernie, David and George. Elsie will be fondly remembered by her many nieces and nephews and sadly missed by all her close friends. Elsie was an avid Maple Leaf hockey fan, excelled at lawn bowling and was a devoted curling follower. She longed for the Tiger Cats to win the Grey Cup and cheered on the Blue Jays. A computer wizard, she followed friends and family on Facebook and she was a better than average Bridge player who played with strategic intent. Elsie was proud of holding a driver’s license until the end and, after many appearances, this will be her last time in the newspaper. The family would like to thank all the staff and volunteers at Big Hill Lodge in Cochrane, Alberta for their support and love for Elsie over the past 6 years, and the staff and volunteers in Unit 32 at Foothills Medical Centre, Calgary for their care and thoughtfulness for both Elsie and her family. In keeping with Elsie’s wishes, cremation has taken place. 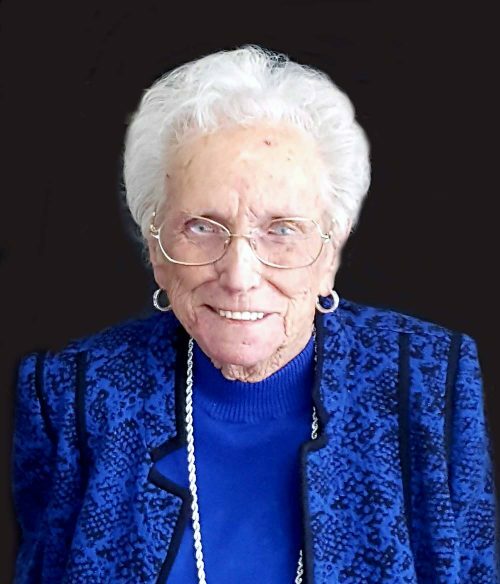 A service will be held at a later date in Brantford, Ontario and Elsie will be buried alongside her husband in Cayuga, Ontario. In memory of Elsie, donations to the Big Hill Lodge (98 Carolina Drive, Cochrane, AB T4C 1X5) are appreciated. On-line condolences may be expressed at www.cochranecountryfuneralhome.com. Cochrane Country Funeral Home 403-932-1039. *** Please note – to leave a comment below, you must also check the box ‘I am not a robot’. This is a security feature and your post will not publish unless checked. Thank you. fun and laughter who touched so many lives both while she lived in Ontario and Alberta. We are so sorry to hear about your Mom. She was always so full of life and will be surely missed. Our thoughts are with you all. Love Bob and Cheryl Laking and family. Please accept our sincere condolences Liz, Ashley and family. Mom (Dorothy) and I are so very sorry about Elsie’s passing. Mom is missing her a lot and my visits to the Lodge will never be the same without your mom stopping by for a hug or a laugh. We will miss her dearly. What a woman she was; so full of life and she lived it to the fullest. I have some great pcitures of you and Elsie, Liz, including ones where she was dancing up a storm with you at the Lodge events! Her energy and humour were infectisous and I am so glad I got a chance to know her. My mom, Dorothy, will miss her spirit and friendship. Thinking of you! Love, Cheryl and Dorothy. Sending our love, Letty. Our mothers bring us into this life and abide by us even after death. She will rejoice in your new life in NS. Our deepest sympathies for the loss of your mother. Please accept our condolences. We will miss Aunt Elsie. She had a great sense of humour..
We are keeping you in our thoughts and are sendiing you our condolences. Elsie was one of a kind! We are keeping you in our thoughts and are sending you our condolences. Elsie was one of a kind! Dear Sharon, Pete, Jeff and Liz, we will always treasure our memories of your mom and our family reunions. She was a ‘corker’ as they used to say. We loved her. The Henry Family: Pat, Robin, Wendy, Pam, Beth and Laura-Jane. I remember Elsie fondly at the Lake Erie cottage. Many years ago during one of Wendy’s and my visit there, a reunion of sorts was held, and I danced with Elsie; she was funny and warm hearted. Deepest sympathy to Elsie’s family .— We remember the many times we lawn-bowled with her at the Dufferin Lawn bowling Club in Brantford. Rest in peace dear friend. My Condolences to Elise’s Family. Elise was amazing. Thank you for your smile, your zest to live life to the fullest, your contagious laughter, your unconditional love. Thank you for showing me how to dance my first waltz. Thank you for you just being you. Rest in peace. Our deepest sympathy to Sharon, Peter, Jeff and Liz and their families. We are so sorry to hear of Elsie’s passing. She was a wonderful person and full of fun and laughter, she will surely be missed by everyone. Keeping you in our prayers during this difficult time. Sending you kisses and hugs. Love Eddie and Sharron Covell and love from Dorothy.